Have you ever asked how the most commonly used meme font is called? I can give you the answer. The font is called Impact. Impact is included in the “core fonts for the web” package and has been distributed with Microsoft Windows since Windows 98, which means you should have the font already installed if you use this any Microsoft operating system. The very thick strokes of the Impact font are aimed, as the name suggests, to “impact” or in other words to stand out. The Impact font is commonly used for funny Internet memes like the Lolcat images. 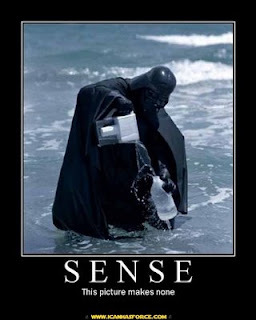 But we now need this black border around the text like in all the other funny memes of the internet. We have to right-click on our new text layer and a menu pops up where we choose and click on “Blending Options…”. What we now still could do is moving our text. Just click on the text layer again and move the text until you feel it fits in the image. Some meme photos do even have black borders, I wrote also a guide how to add black borders to your images, in case this is interesting for you too. If you like to read more about internet memes, do also check out my article why internet memes are so popular, or read more about Impact the most popular meme font. 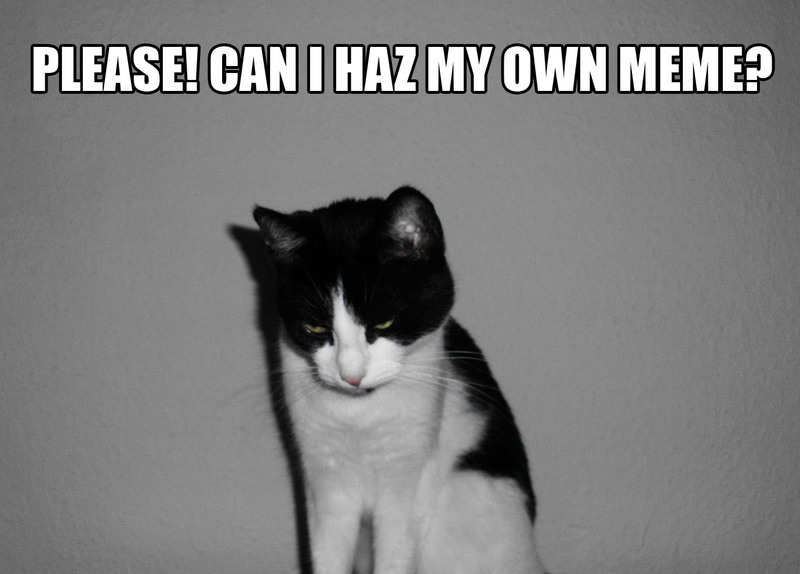 If you want to create memes in no time, check out the list of online meme generators. Thank you for your friendly feedback 🙂 Great to hear that you found the guide to be useful. Thank you, I couldn’t figure out what font it was for the life of me. Nicee! but then how about the meme with a picture and black frame with white text below.? Do you mean that you want to add a black frame around the image? There are several ways to do it. It is just a question how much room you have on your image to do so, without hiding the important photo elements. If your image does still have enough room to offer on the outsides to replace it with a black border, then I would do it this way…. 1. 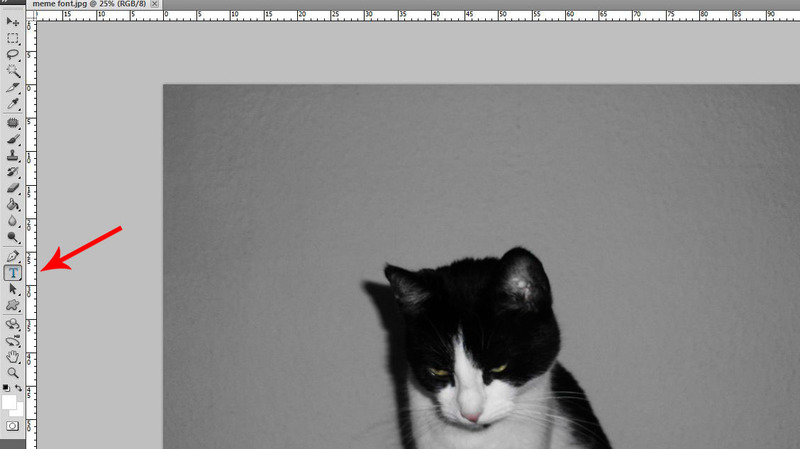 Load your image in photoshop and duplicate the layer of the image (menu / layer / duplicate layer). This is something you should always do to have the main image untouched, incase you would like to restart editing. 2. Then you can select your new layer, I mean the new copy of the image. Then adding strokes would be one idea (menu / edit / stroke). In the stroke menu you have to choose “inside”. Then you can still choose how much pixels you want the frame to expand inside of the image and you can choose a colour, for example black. 1. Select your layer and expand your image with (menu / image / canvas size). In the canvas size menu, click on “relative” and then type in your width and and height (in pixel) for the border and choose pixel beside both values. Make sure that you also choose your colour for the border in the same menu. 2. Again optional but you can also here try to seperate the newly created borders and the main image. The techniques are little bit similar like in point 2 of my first method. There are even some other methods to create borders. But depending on what kind of image you have and how much room there is on the outsides for borders, the two methods above should help you out. Adding text on the border is as simple as in the tutorial article here descriped. I thought they were asking which font is used in the memes that just have a picture with a black background and white text. It’s definitely not Impact, and I’m having a really difficult time trying to figure out what it is. You’re rad. Thanks for the simple explanation! This is much more fun compared to all the meme creator or meme generator tools. Photoshop gives much more fredom in creativity. I really dislike meme templates. With help of your tutorial I am now able to create my own memes. Thanks for the tutorial! I do agree. Photoshop does not limit you like any meme creator or meme generator website. “Fredom of creativity” really fits as a saying. Thanks for your opinion. Easy and very handy! Thanks for this one bro! Im confused, how do you create the black border around the text? Idk what this “new text Layer” for one, is supposed to be. I have added another screenshot. Go back to the part with “new text Layer” in my tutorial here. On the screenshot you can see how this text layer or object looks like. Layers are usually in the so called “docked panels” in photoshop. It´s the panel on the bottom right. Let me know if you have still questions. I´ll help you out. Ty for the help and feedback man! Thanks for the quick tutorial. It was right to the point, minimal nonsense. Thank you for giving feedback. Happy to know that you liked the guide. Hope it helps you to get creative with your ideas. 10. Change font to impact. 12. click “Text Fill” and choose white. 13. Click “Text Outline” and choose black. 14. Click “Text Outline” again and click “Weight”. Choose 2 1/4 width. 15. Adjust your text position in the image by clicking the text, click and hold the broken lines in the sides, and dragging it to place. 16. Press “Print Screen” in your keyboard. 18. Paste (Ctrl + V) it in the Paint window. Once done with Photoshop, you will be able to create a meme in just a minute like in every other program too. I can´t see that you minimize time. And “better results” is completely subjective. Since Photoshop does allow much more than adding text, a heavily tweaked image in Photoshop will be much more visual appealing in my opinion. My article was aimed to Photoshop users. 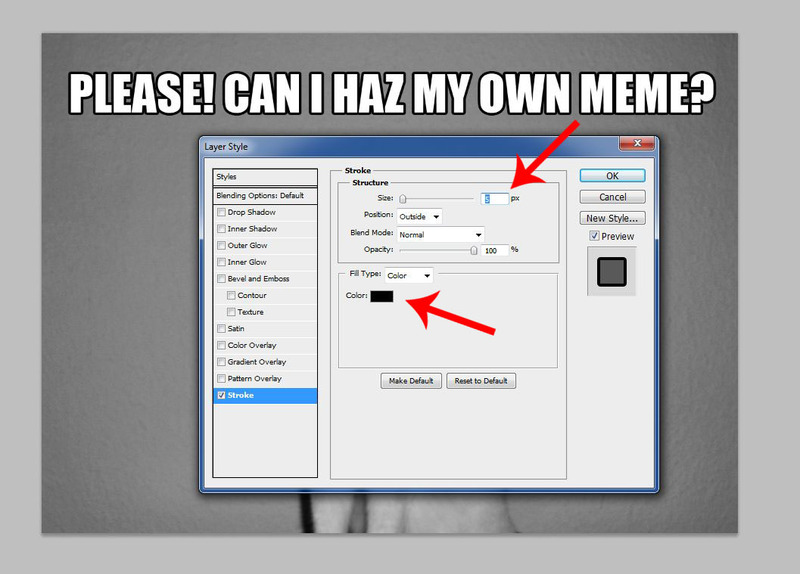 You can use many programs to create memes. 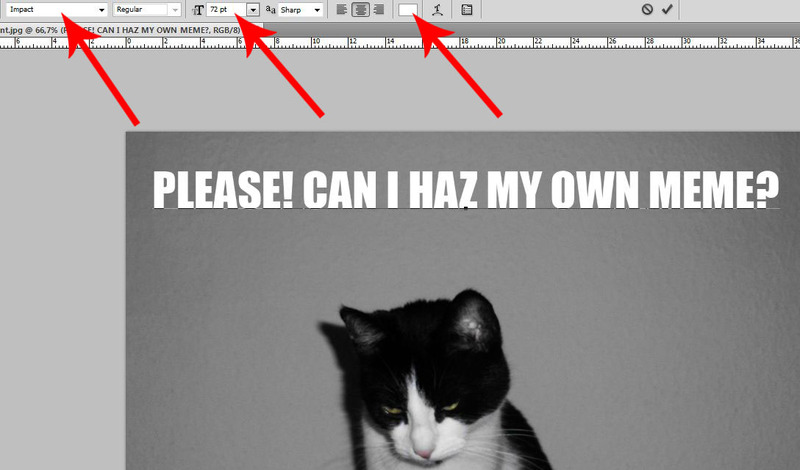 It works with dozen of other free tools too (Gimp for example). If you want to do a little bit more than adding just text to an image (tweaking and edit the image or add things), then MS PowerPoint won´t help you out that much like Photoshop. And by the way. PowerPoint is not a default program of Windows (I dont have it on board of Windows 7 professional). But right, MS Paint is a default program of Windows. Other than that, you made a nice addition to my article, in case someone does not have Photoshop. It might be helpful for those who want to do it with PowerPoint (well, in case they have PowerPoint). Thank you for the addition. Awesome, now I don’t have to use online meme generators! Thanks man!! Very easy, straight to the point. Glad you found this meme guide helpful. Thanks a lot! Very helpfull! in photoshop i can only find impact regular even when i search, help please? Thank you so much, great tutorial. Wow, a great find. Easy, understandable and a great tutorial. thank you i really need this because my professor assigned our class for a meme project, thank very much dear sir. Very useful tips! Thanks Dennis! That is a very basic question 🙂 You open it like with any other image software… right click on the image in windows and choose “Open with…” and the program you want to use, in this case PS 7.0. Thank you for letting me know which font to use. I made a meme in a few seconds flat. Good job! Hi Jon. I am glad I could help with the article. 🙂 Thanks for your feedback. Thank you for your generosity and work! This was very useful. Thank you. It helped a lot. This is a very well-written article. Thank you, I am glad you liked the article. The font most people use is not impact for memes, but its Helvecita Black Condensed. Just a quick note! You’re awesome. Thank you SO much! This made my life much easier to have all the settings so nicely spelled out. So easy when you know the right font! 🙂 Using the ‘Stroke’ for this effect is quite cool; I tended to use a different technique for the borders, but yours is far better and way easier to do! Thanks very much! As a fan of lolcatz and icanhascheezburger since day 1 (and the fan gear to prove it – bukkit). So finding your blog post here is MAGNIFICENT! Love making original memes and now they can be more recognizable with the official font. 🙂 Thanks Dennis!! A debt of gratitude will be repaid through many memes!